After focusing on my Flames of War (FOW) Allied forces for a while, I decided to throw some energy back into beefing-up and diversifying my late war Germans. Although my German troops seldom see play, getting some infantry punch on the table led me to a number of mortar and other support weapons platoons the FOW rules offer. Battlefront, the maker of FOW, has a number of good platoons which run anywhere from about $12-20 each. 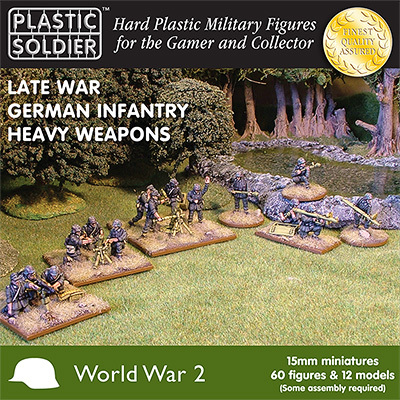 Having recently tried my hand at the Allied Stuart Tank set from the growing line of 15mm WWII kits from the Plastic Soldier Company (PSC), I spotted the Late War German Heavy Weapons box. At around $25, the set looked to be an excellent and economic way to get a lot more German infantry on the table at perhaps a quarter to one-third the cost of the official FOW models. 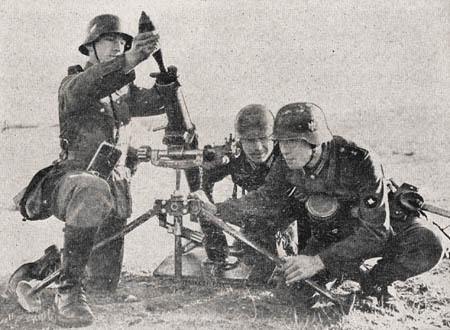 The PSC box comes with four MG 42 teams, four 8 cm mortar teams, four 12 cm mortar teams, eight Panzerschrecks and eight Panzerfausts. Also included are four Panzerschreck loaders and four ammo carriers. With about 70 bits on the sprues, this set was going to add a lot of action to my already extensive German infantry collection. Cutting out and gluing-up the tiny pieces from the PSC sprues is a bit of nerve-racking task harkening back to my early years wrangling with assembling soft plastic HO scale Airfix soldiers. That said, following PSC’s simple assembly diagram (above) and keeping all the parts carefully organized on the workbench is key to getting the job done right and not losing anything along the way. 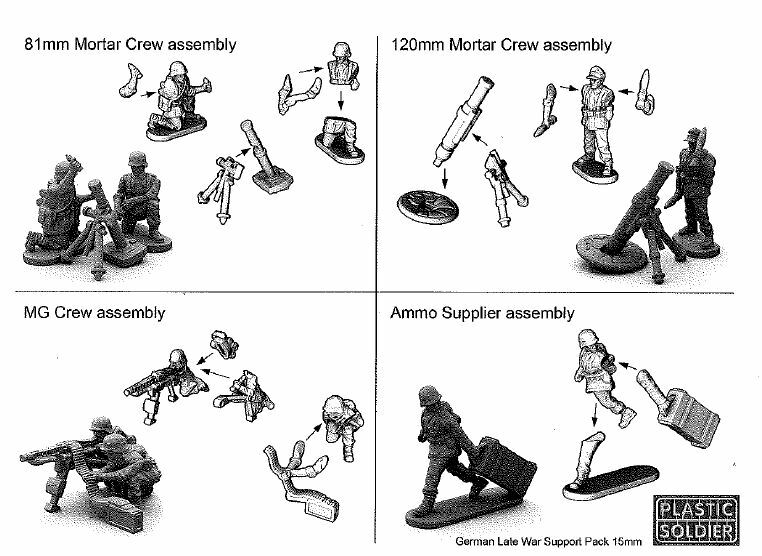 Flames of War rules call for basing Panzerschreck teams in groups of four miniatures per medium stand, allowing for four total teams to be constructed from the PSC set with two Panzershrecks plus a loader and ammo carrier per team. The 8 cm mortar and MG teams likewise went on medium bases and the big 12 cm mortar teams were glued-up on larger bases. 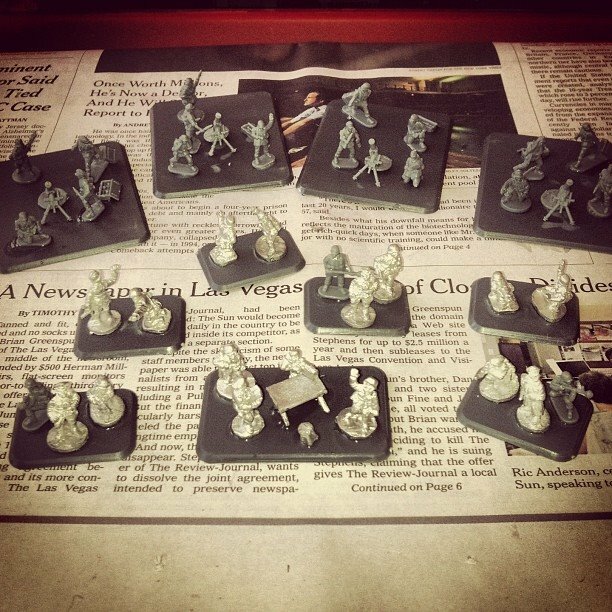 I had a few extra plastic FOW Germans on hand from a bonus promotional sprue I received from the Open Fire! 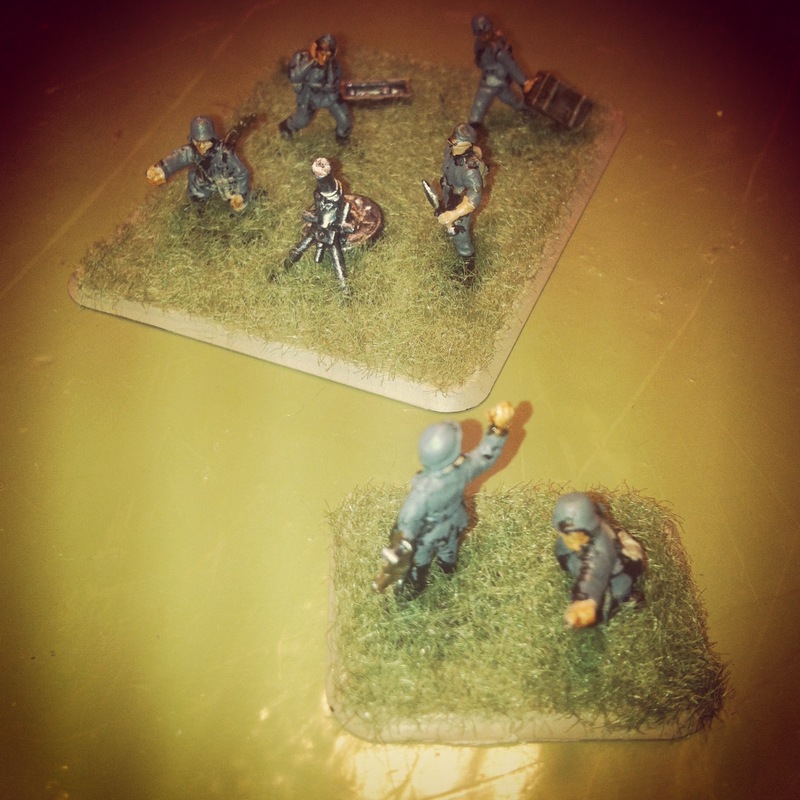 box set, and adding those to the 12 cm mortar stands helped finished those off. With a bunch of new mortars in the field, I also needed to add some additional command and spotters to make them playable. FOW offers an artillery command headquarters blister pack which I added to the mix. 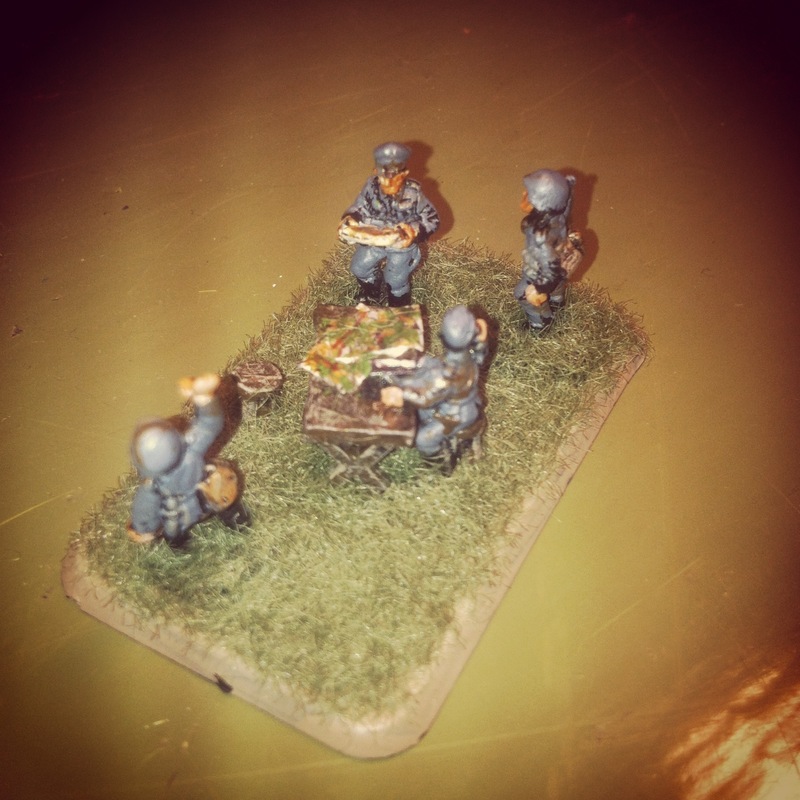 The set comes with enough models that I was able to create three two-man spotting teams, a few command stands (adding in Panzerfausts from the PSC kit) and a nifty HQ vignette with a four figures surrounding a table with a radio operator. Painting Germans is a simple process for me with a base spraycoat in flat black followed by a darkish grey uniform and details picked out in flesh, blacks, browns and gun metal. The stands get finished off with some simple grass flocking and a matte varnish spray. 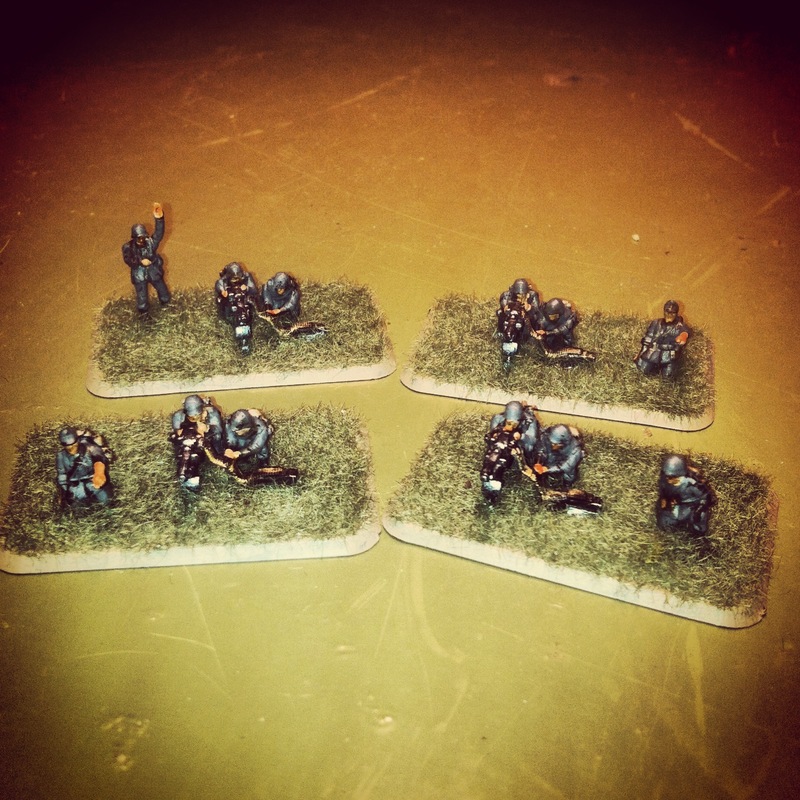 Getting a consistent finish on the PSC models made them blend in nicely with my FOW models. For comparison’s sake, the PSC figures do tend to be a tad smaller and thinner than the typically-chunky FOW figures. Since most my PSC figures are being fielded on separate stands, I don’t see the minor scale differences being an issue at arm’s length on the tabletop battlefield. In addition, the extra poses in the PSC casting add some nice variety and animation in the troops once deployed. My FOW German force has long-relied on the strength of deploying large numbers of tanks in my games, so these new additions should be a nice compliment to getting more action from my German infantry. 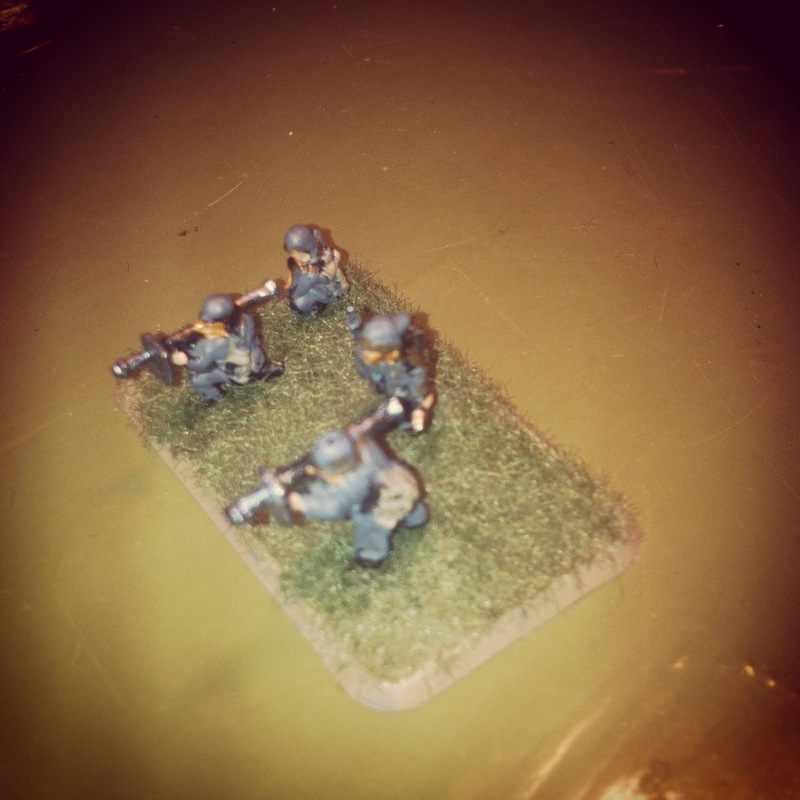 Now that it’s fall, I’m anxious to rush my new PSC and FOW Germans to the tables at Metropolitan Wargamers in Park Slope, Brooklyn and add a new season of playablity to my battleworn forces.